Background: Colostomy closure after a Hartmann’s procedure typically requires a laparotomy. It also carries the risk of significant morbidity including anastomotic leak, wound infection, and incisional hernia. The aim of this study was to review our experience with laparoscopic restoration of intestinal continuity after Hartmann’s procedure. Methods: we retrospectively reviewed the medical records of all patients who underwent laparoscopic colostomy reversal between Jun 2001 – Jan 2009. Results: Twenty nine patients underwent laparoscopic colostomy closure, all were left sided procedures. 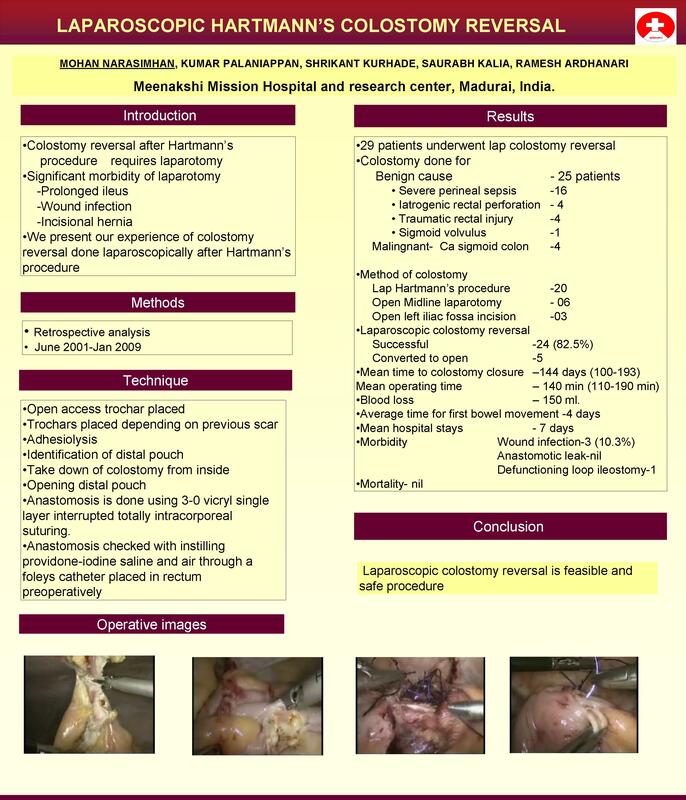 The laparoscopic approach was successful in 24cases (82.75%). There were four conversions, due to dense adhesions to rectal stump. The mean time for colostomy closure was about 144 days (100 -193 days). The mean operating time was about 140 min (110-190min). All patients underwent single layer hand sewn anastomosis. The estimated blood loss was about 150ml. The average time for bowel function was 4 days. The mean hospital stay was 7 days. There were no anastomotic leaks or mortality. One patient underwent covering loop ileostomy, due to low anastomosis. Three patients (10.3%) developed wound infection. Conclusion: Laparoscopic colostomy reversal after Hartmann’s procedure can be performed with low morbidity and a short hospital stay. The need for conversion to open surgery is uncommon despite patients’ previous surgeries. A laparoscopic approach to colostomy takedown is safe and feasible and may result in a reduction in complications and length of stay as has been seen with other minimally invasive procedures.